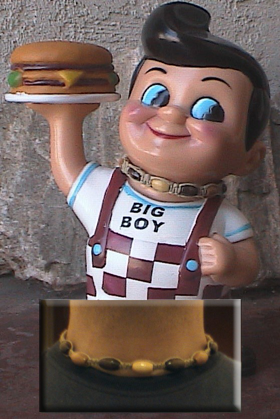 I realize that on the dorkometer I am probably off the charts but I was bored earlier today so I made a necklace for my Bob’s Big Boy piggy bank lol. It’s not an exact replica but it was the best I could do with what I have to work with. Of course I had to attach a picture of my necklace below his to show how the colors are the same, although they are spaced quite a bit apart and the hemp is smaller in mine but it’s basically the same thing. Who cares about semantics hehe. It was fun to make, there were times I thought it might be too long with all the knots and the amount of beads but it worked out on the first try. Now, I see 2 teddy bears who don’t have any jewelry on.